Featuring no more than 1,200 passengers and as few as 900, Celestyal Crystal provides cruisers with an intimate opportunity to cruise to exciting destinations all over the world. 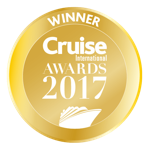 As Celestyal Cruises' smallest ship, you'll experience their award-winning Greek hospitality and service from start to finish, making you feel completely welcome and at home. Sumptuous Greek cuisine can be enjoyed in the ship's Olympus and Amalthia restaurants, and the many lounges allow no end to the relaxation and socialising onboard. With additional facilities such as the swimming pool, fitness area, casino and duty-free shop, you won't be left with little to do onboard. Celestyal Crystal offers more dining choice than their other ships with two full restaurants, and two additional casual dining areas. The deck 5 Olympus Restaurant and deck 8 Amalthia Restaurant are your main venues onboard, featuring a more refined interior and serving formal dinner menus. Sitting opposite each other are the Leda Buffet and Aura Grill. Each venue offers their own quick, light and casual options for guests to enjoy while taking in the excellent views from their position on deck 9. Immerse yourself in Celestyal's exciting music, dance and entertainment hosted onboard. Each performance will leave you humming and toe-tapping for hours to come. Guests have a choice of four lounges: the main two-deck Muses lounge featuring a dance floor; the Eros Lounge, Sports Lounge, and the Horizons Lounge. Be sure to try your luck at the ship's casino located next to the Eros Lounge. Health and fitness facilities are available including a beauty center, a sauna and a well-equipped gym. Celestyal's extensive programme keeps guests busy onboard with cooking demos, quizzes, ship’s bridge tours, Zumba classes, language lessons and more. Alongside the plentiful lounges, Celestyal Crystal has an open deck for guests to enjoy the sun along with a swimming pool and the poolside Helios Bar. Alternatively the small and quiet Thalassa Bar has a jacuzzi you can relax in.